For some people making sure the timing is right for things is often very important to them, while for others it is better to create the right time for things. 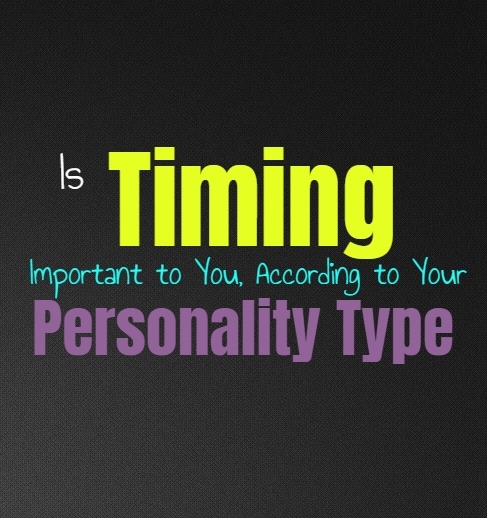 Here is how important the idea of timing is to you, based on your personality type. For INFJs timing does seem to be something they value and analyze. If they see that something isn’t working out as they hoped, they can often attribute that to the timing being off in that situation. INFJs believe in doing things at the right time and not just jumping in without considering whether or not they should. They don’t want to make mistakes by rushing into things and so for the INFJ it is important to at least consider timing. For ENFJs timing is definitely important, especially when it comes to making the right choices. They believe in being prepared for things and so sometimes this means trying their best to figure out what the right timing would be. For ENFJs if something doesn’t go right they might expect that the timing is off and that they need to find a different approach or way of handling things. ENFJs do believe in the importance of timing, and so they do their best to figure out when they should and should not approach a situation. INFPs aren’t always great at focusing on timing, instead they just follow what feels right for them. They might believe that timing is important when it comes to people and how they express themselves with the ones they love. For the INFP it matters how they approach things, but they follow their hearts and so sometimes this causes them to neglect timing. They go with what inspires them and aren’t always capable of holding back in hopes of waiting for superior timing. ENFPs don’t often pay much attention to timing, instead they go for what they want regardless of whether or not it seems like the best time for it. When the ENFP becomes focused on something they don’t want to wait for it, and can actually be a bit impatient. They would rather take the chance that timing isn’t right, than wait and discover that they should have taken that risk. For the ENFP timing isn’t as important as experiencing life and going for what they want. INTJs do believe in paying attention to details and ensuring they are making smart choices. While they do consider timing, it isn’t something they use as an excuse. They might even feel like they need to make things happen themselves, regardless of if the timing is ideal. They are capable of being patient when they need to wait for certain things, but won’t just waste time if they can find a way to push past the obstacles. INTJs will consider every angle before approaching a situation, but they won’t use timing as an excuse to hesitate. ENTJs do believe in being smart and approaching things with a sense of logic and reason. They will consider whether or not timing matters in any given situation, but they will often feel it is necessary to make the situation work regardless. If things seem a bit difficult they don’t just use the excuse that the timing isn’t right, instead they want to push past this and make it work. They are strong-willed people who don’t like making excuses, instead they strive to be efficient and achieve what they want. INTPs do often consider timing and whether or not it seems right in any given situation. Sometimes the INTP will analyze a situation and feel like the timing is off and so this can cause them to hesitate. They don’t always feel like pushing past the timing of a situation, instead they are likely to wait it out in hopes that things will come together better down the line. This can sometimes hold the INTP back, since their analyzing minds can often feel like things aren’t quite right or ready. ENTPs try not to get too hung up on timing, especially when they see something they want. Even if the timing seems off they often want to find a way to overcome this. When ENTPs really want something they have a hard time really holding themselves back. They want to go after things with a sense of openness and eagerness, even if it feels like the timing isn’t perfect or ideal for them in that situation. ISTJs do believe in always being prepared, and so timing plays a small role in these situations. They will do their best to prepare for things and will be willing to wait for when the timing is ideal. ISTJs do believe in being prepared but they don’t want to make the mistake of hesitating when they should be powering through. They also believe in making things happen and so they want prepare themselves but also find a way to overcome any hiccups when they need to. ESTJs believe in being prepared but they don’t often care much for ideal timing. They see what they want and to after it without allowing anything to stand in their way. ESTJs don’t wait for the right or perfect timing, instead they fight for what they want even when it seems impossible. They are very driven and willful people, who don’t like just waiting for things to happen in their lives. ISFJs do believe in timing with certain things in life, but they don’t like using this as an excuse. If something is t working they often try to overcome this and find other ways to make it work. They have goals which are important to them, and so the ISFJ doesn’t want to flounder or fail to make these things work properly. They have a lot of pressure on their shoulders, and so they don’t usually have the patience to simply wait for the perfect timing. ESFJs don’t care much about timing, instead they believe in going after what they want or need to accomplish. When it comes to timing ESFJs often see this as an excuse to hold back or avoid responsibility. When something seems challenging they simply want to push past this and find a way to make things work the way they need them to. For ESFJs timing is something they cannot really afford to focus on. ISTPs don’t really care much about timing, since they live more in the present. They focus on what feels right in that moment, instead of trying to wait for the perfect timing to occur. If they want go experience something they are likely to go for it without waiting. ISTPs can sometimes be impatient people because of this, not wanting to wait around for things to change. ESTPs don’t really care about timing or waiting for things to be perfect. Instead they want to experience things in the moment and not just wait around for the timing to be ideal. They go for what they want and try to really focus on enjoying the present. For the ESTP timing feels like an excuse, instead they experience things when it feels right for them. ISFPs aren’t ones for timing or trying to wait for things to fall perfectly into place. They don’t want to hesitate and instead prefer to focus to living in the moment. For ISFPs it is important to follow their heart and really experience life in the present. They are eager to dive into new things and don’t believe in waiting for the right timing. ESFPs don’t care much about timing, they just want to live their lives freely. They go after what feels right for them and want to really enjoy the present. ESFPs don’t allow the fear of timing to hold them back, instead they go after what excites and inspires them the most in life. They are very capable of pushing past the timing of a situation, and just focus on making things work the way they want them to.